To acquire hardware requires a sense of balance increasingly refined. Compact integrated options can provide a quick fix, but those who seek flexibility and robustness in their configurations know exactly what hardware points are needed to improve their setup. 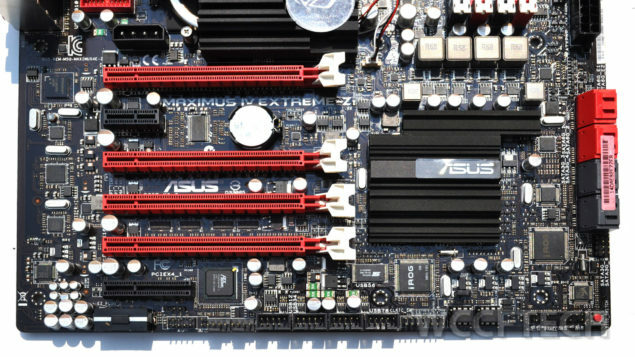 If you plan to have a computer platform based on Sandy Bridge, perhaps this new motherboard from Asus may attract your attention. There is a very important dilemma that every hardware enthusiast faces. Ideally, buy the best components in all cases, but always make some sort of compromise. In some cases, you may sacrifice some processing power for faster graphics card (and vice versa), but the relevance of the base line is intact. In the end, all components will have to go through testing, and no one is looking forward to a computer that goes down like a house of cards. A few months ago we heard of an excellent choice based on the Gigabyte Socket AM3 +, but this time, we have a model that will appeal to anyone interested in Intel’s Sandy Bridge. 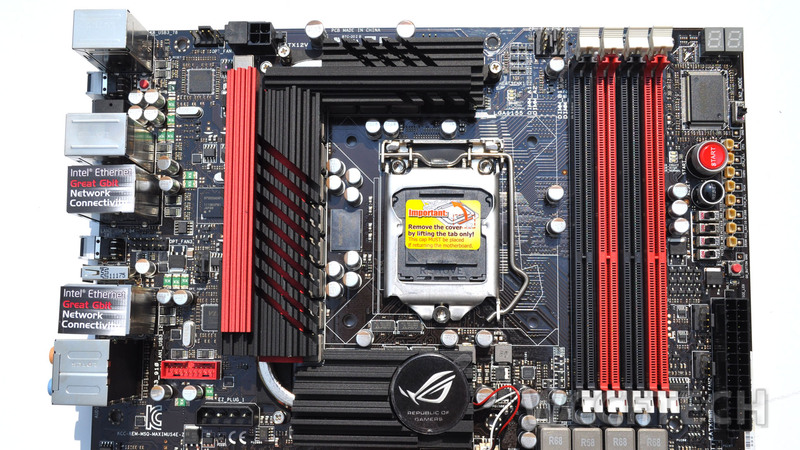 The board is from the Asus Republic of Gamers series and comes in a traditional (read: humongous) ROG box. The box has a large central window which shows a bit of the board. Inside the red cardboard container is a clear transparent plastic shield which protects the board. Below the board is cardboard container which holds all the accessories. The board comes loaded with accessories and extras. Apart from the usual manuals, disk, cables, USB 2.0 module and Asus “Q” accessories the package contains a Bluetooth module, a set of decals to label optical drive cables, SLI & XFire bridges, temperature monitoring cables and probelt connectors. There are some cable ties in the package as well. What is missing is a front USB 3.0 box. 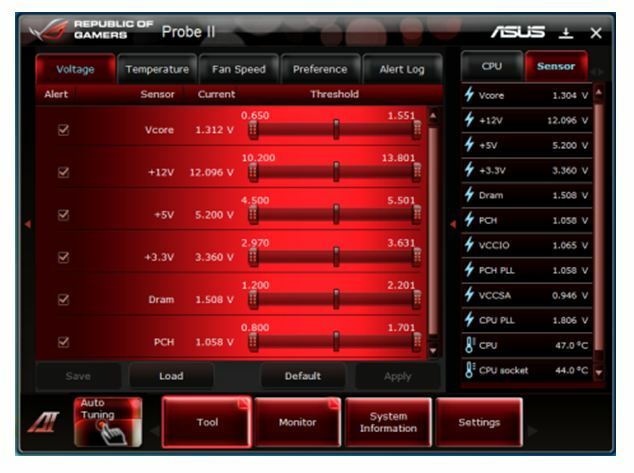 This is something that Asus includes in its P8 series boards, but surprisingly omits it from the ROG series. Like all ROG boards, red and black colors are liberally used all over the board. 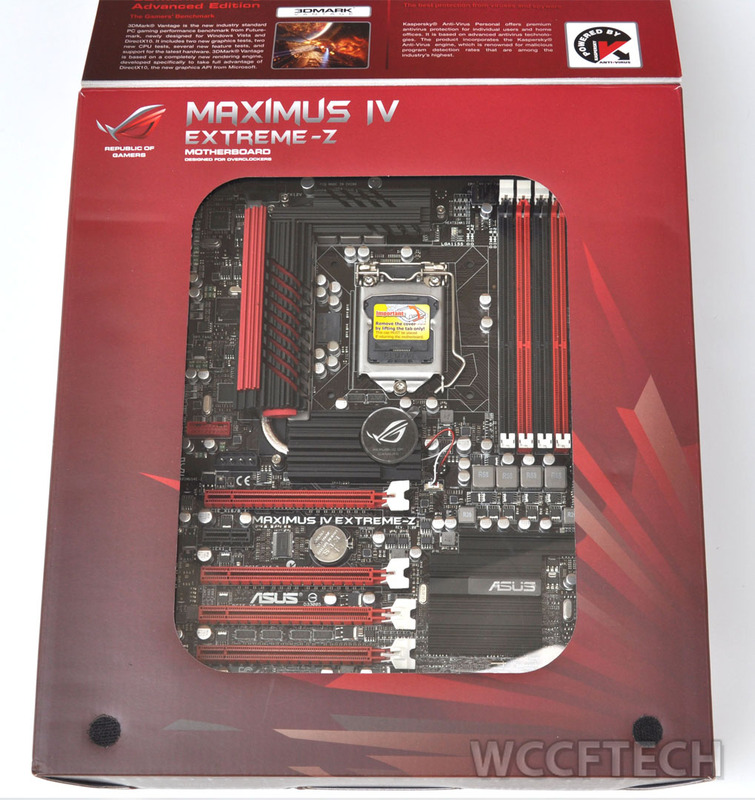 This full length E-ATX features high quality components for CPU and memory power regulation. 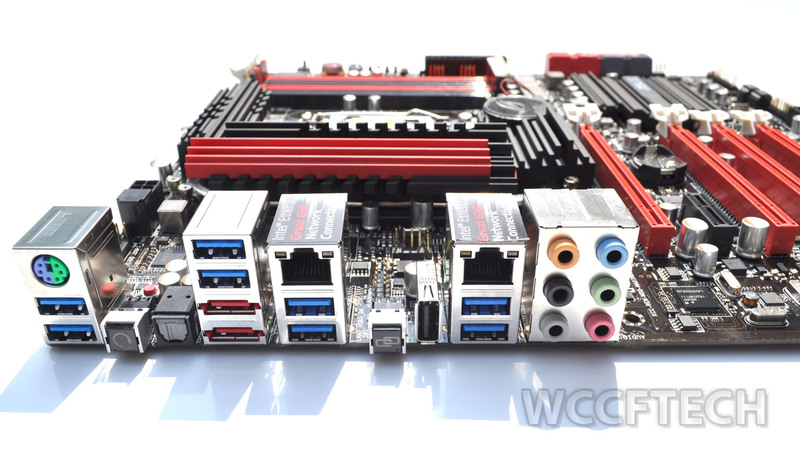 8 phase CPU power, 3 phase memory power and 4 phase iGPU power regulation circuitry employs the best components. All power circuitry is passively cooled. The heat sink that cools the NF-200 has a nifty ROG logo that is illuminated by a red LED. All heat sinks share a common heat pipe. The voltage regulation circuitry is covered by passive heat-sinks connected by a heat pipe. Despite the presence of heat sinks, the board can take almost any aftermarket cooler without breaking a sweat. We tested our setup with a HR-02 and had no problems installing it. In front of the socket area are the memory slots which feature the excellent single clip retention mechanism. A lot of goodies are located in front of the memory slot. The diagnostic LED display, probelt, power & reset buttons, the LN2 switch as well as the PCI-e x16 slot switches are located here. A small red mem OK! button completes the tour of this area. Probelt allows direct measurements of all essential voltages. Moving along the front edge we find the 8 SATA right angled ports. 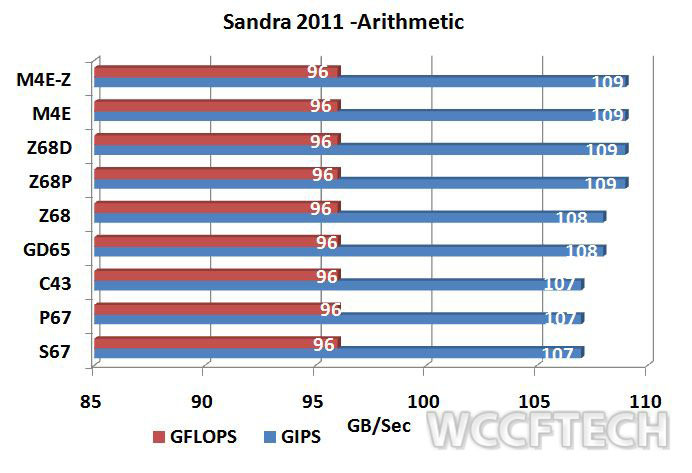 The red ports are SATA 6 Gbps compliant while the grey ports work at SATA 3G Gbps specifications. The extra SATA 6 Gbps ports are powered by a Marvell controller. E-SATA functionality is provided by JMicron IC. The left edge of the board is very busy. It features the front panel connectors, USB connectors (2x USB 3.0 and 8x USB 2.0) and a clear CMOS button. The Z68 PCH is covered by a low profile heatsink and should not interfere with extra-long add-on cards (read GPUs). 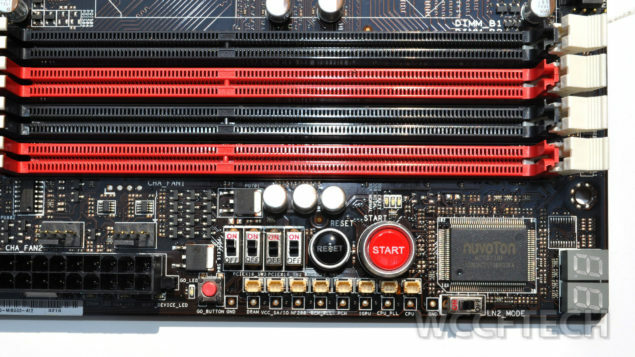 The board features 4 PCI-e x16 slots. 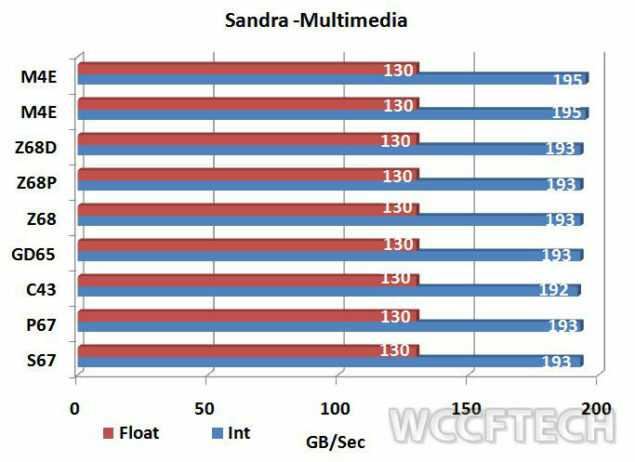 Although enough lanes are available to offer x16/x16 mode in a dual GPU configuration, Asus limits bandwidth to only x8/x8 on slots 1 and 3. This is done to bypass the NF200 which improves latency and over heads required to pass through the bridge chip. 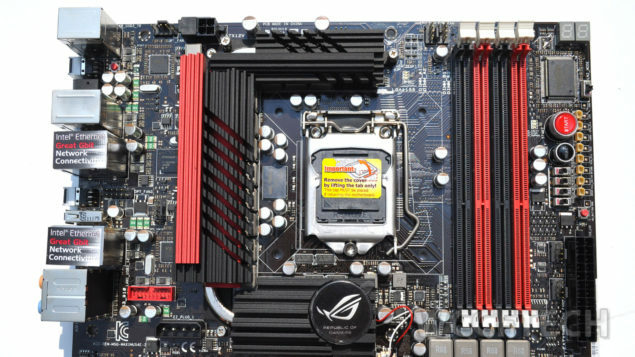 Asus recommends using these slots for dual GPU configurations. Though the end user can simply use slots two and four to gain full x16/x16 bandwidth but that would incur the additional overhead as the extra lanes pass through the NF200 chip. In a three card configuration the PCI-e lanes are organized as x16/x16/x8 utilizing the power of the NF200 bridge chip. Additional PCI-e lanes are provided by the PLX 8606 chip. This helps power the bandwidth for the 10 USB 3.0 included on the board without compromise! Apart from the usual 24pin and CPU 8pin power connectors the board features 4 pin molex connectors to provide extra power for the PCI-e x16 slots. The board has 8 fan connectors! There is the CPU fan connector, 3 chassis fan connectors, 3 optional fan connectors and 1 power fan connector. All provide PWM (Q-fan) control. There are three strategically located thermal sensor connectors. They can be used to monitor temperatures of various components on the board or in the chassis. The most striking aspect of rear panel connectivity is the absolute lack of USB 2.0 ports. All the ports (8) here are USB 3.0 (powered by NEC). There are 2 E-SATA ports, dual Intel Ethernet ports, traditional PS/2 mouse & keyboard hybrid port, digital SP/DIF port, ROG connect port (a USB port in reality) & switch and the traditional audio ports. Just in front of the rear panel I/O is the internal header for two more USB 3.0 ports though no rear or front panel USB 3.0 headers are provided. What is more shocking is the utter lack of any video outputs. Even if the end user wants to use the GPU integrated on the processor die he (or she) must plug in a discrete GPU. Lucid’s Virtu software will then take over GPU switching as the user desires (in conjunction with the settings in the EFI). The board is identical to the non “Z” version of the M4E. The only difference is the PCH used. This is not essentially a bad thing as the M4E itself was well laid out and was easy to work with. 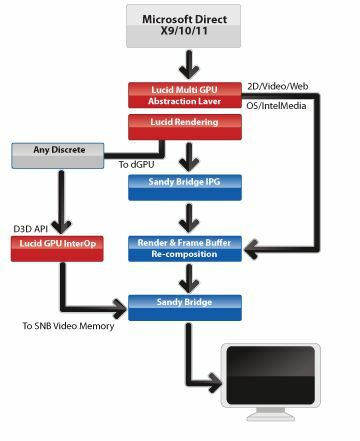 If the video output is connected to the discrete GPU (the “d-mode”), the user gets the absolute best discrete graphics performance as all graphics data does have to go through integrated GPU’s frame butter. Quick sync is still available in d-mode. The advantage of i-mode is power saving as well as access to both discrete and integrated graphics. 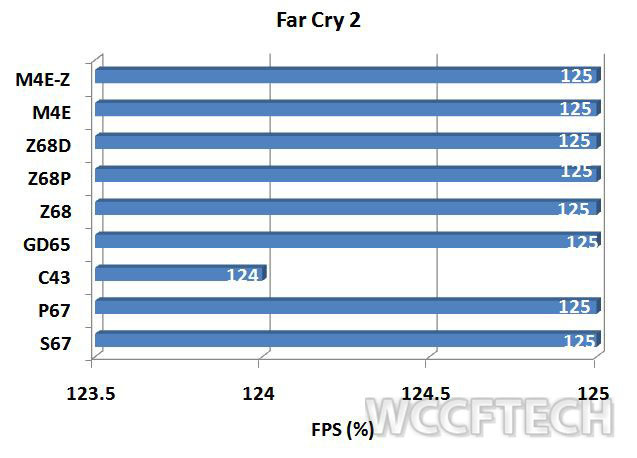 The disadvantage is a performance hit on discrete graphics performance (which could be up to 40% especially in gaming). The advantage of d-mode is absolute best discrete GPU performance, SLI and XFire availability of integrated graphics (for quick sync). The disadvantage is considerably greater energy consumption. It must be noted that Virtu is a requirement for dual GPU use. Intel does not provide its own solution to this end. The M4E-Z does not come with any onboard video outputs. Thus a dedicated/discrete (dGPU) GPU is required to make use of the on die graphics core. 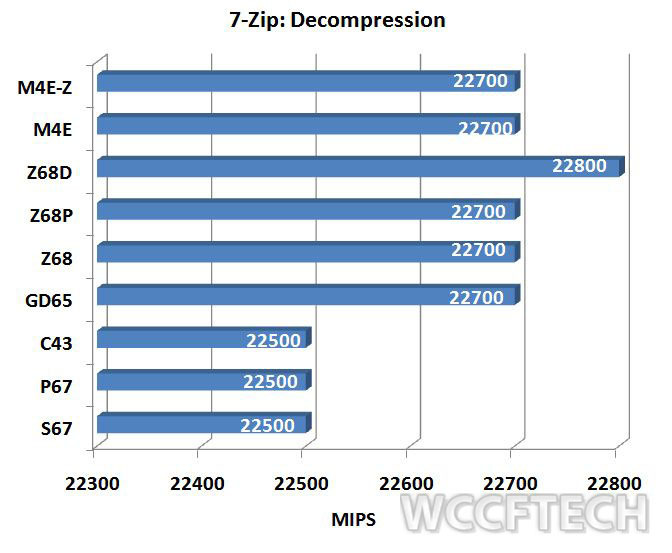 Lucid’s Virtu software together with the EFI controls what graphics core is being utilized. 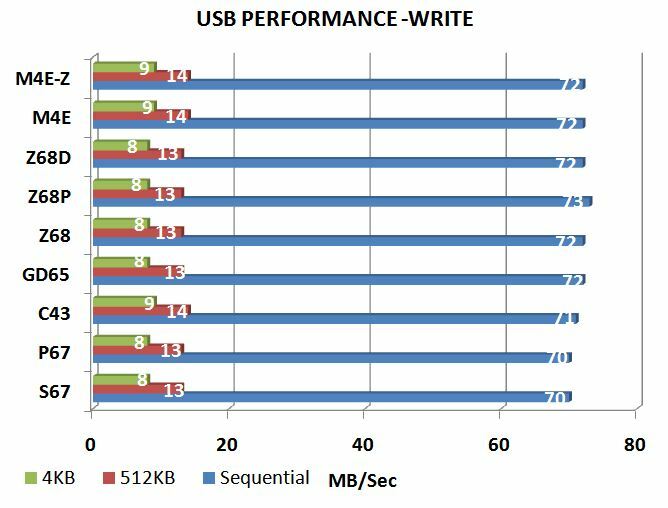 The other feature of the Z68 is its ability to improve hard disk performance by using an SSD as an IO cache for the hard disk, what Intel calls Smart Response Technology (SRT). This is not a hardware feature. Intel can make it available to P67 users as well. Intel’s RAID driver controls caching. It is a pity that Intel is trying to ‘strong arm’ customers into buying a new product whereas the old product can do just a good a job! Intel allows a maximum of 64GB of SSD space to be used as cache. Any remaining space can be treated as a physical drive. 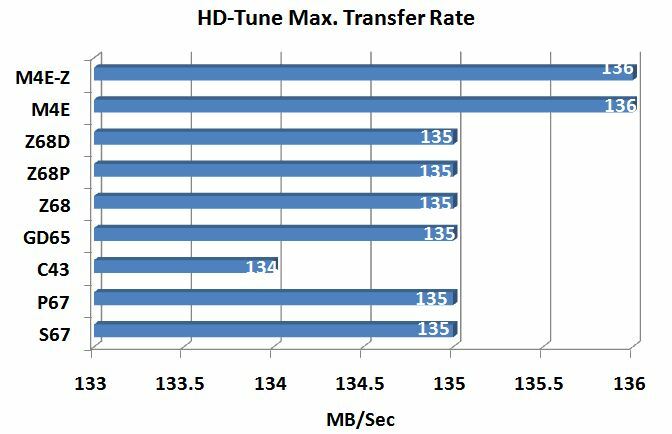 Intel’s driver allows for either a ‘enhanced’ mode (minimal benefits, maximum security) or ‘maximized’ mode that offers maximal benefits, but if the SSD cache dies (for whatever reason) it could have detrimental impact on your hard disk. 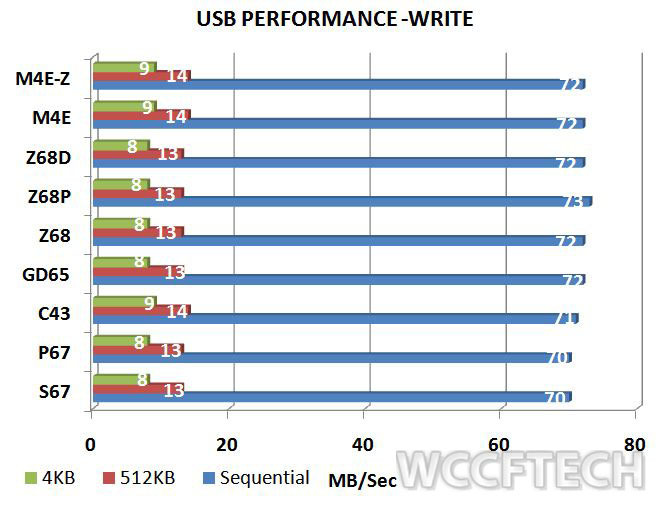 Intel offers its own 20GB SLC SSD to be used with Z68 boards as cache. An improvement of about ~35%, not too shabby! 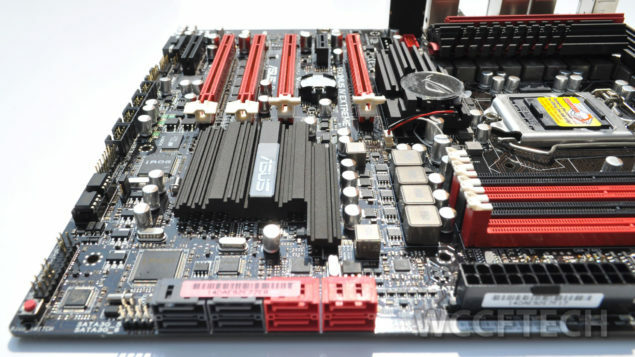 Asus bundles the board with AI Suite II (ROG edition). 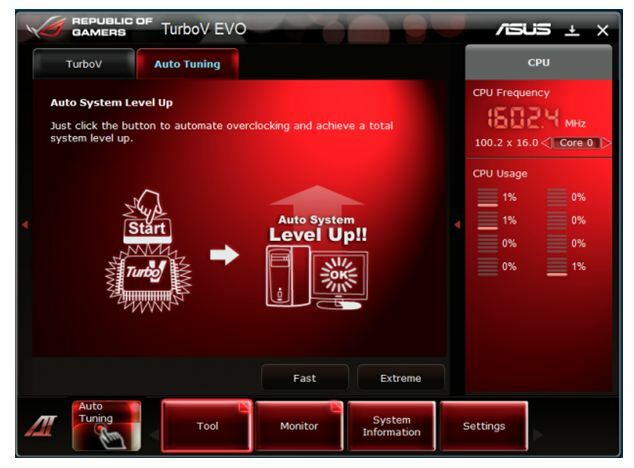 This is akin to MSI’s control center and offers an all in one solution to over-clocking and monitoring. It is possible to utilize automatic over-clocking via Turbo-V, or manually. The latter will be the favorite amongst many of the board’s potential customers. 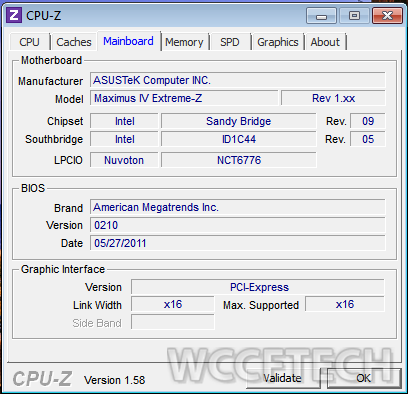 Over-clocking the processor is as easy as a pie and very similar to all other Asus P8Px series boards. The settings are exactly the same as those in the M4E EFI with the addition of over-clocking parameters for the iGPU. We reached 4800 MHz an all-time low voltage of 1.376V on the M4E-Z! Note: It is highly recommended that the latest version of AI Suite II be used. 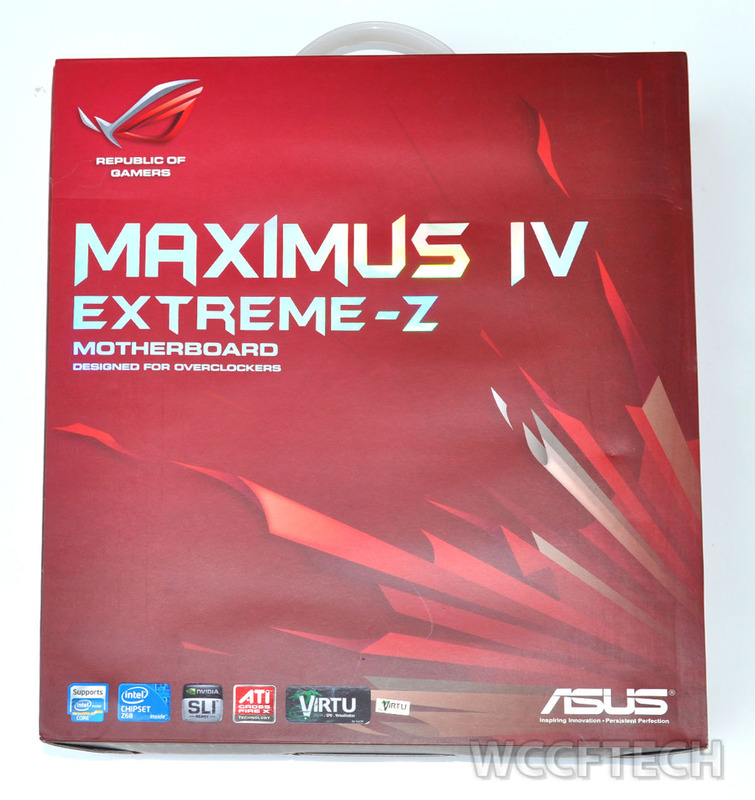 This can easily be downloaded from Asus’s support website. 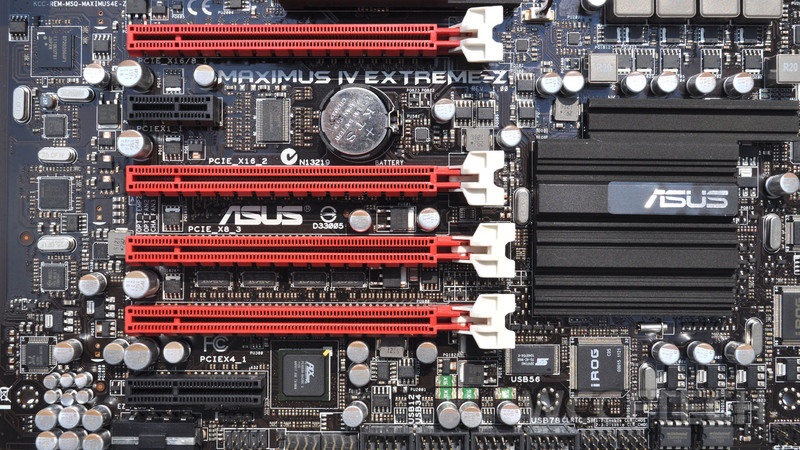 For a motherboard like the M4E-Z, its feature set alone determines its potential customers. Those desiring multi GPU full speed functionality, features to aid extreme over-clocking take precedence over benchmark numbers. It goes without saying the board will perform, but as has been seen before these numbers are not enough to determine which is the best as they all end up performing the same. All benchmark indices are rounded off to the nearest 0. 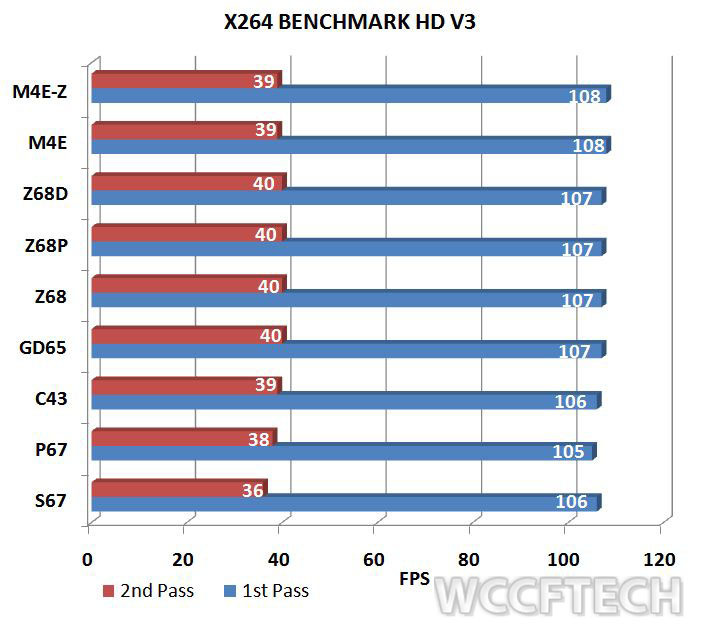 X264HD benchmark measures the encoding performance of the processor. It offers a standardized benchmark as the clip as well as the encoder used is uniform. 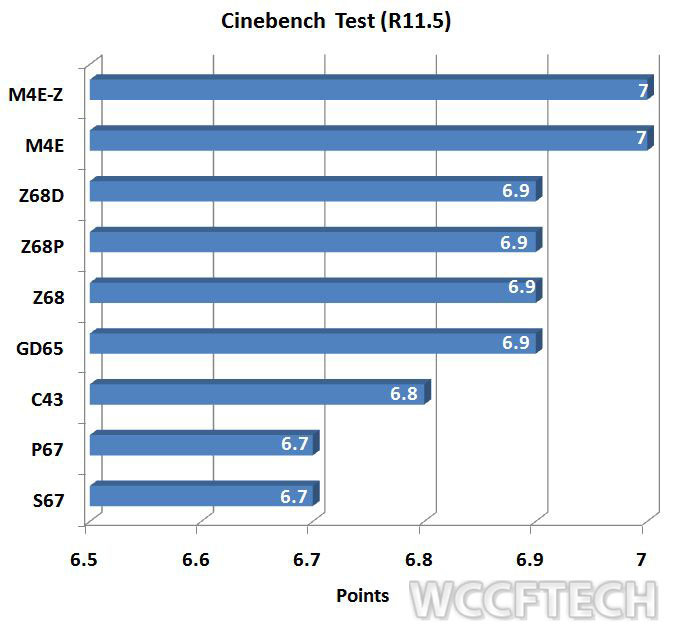 Cinebench is based on Maxon’s Cinema 4D. 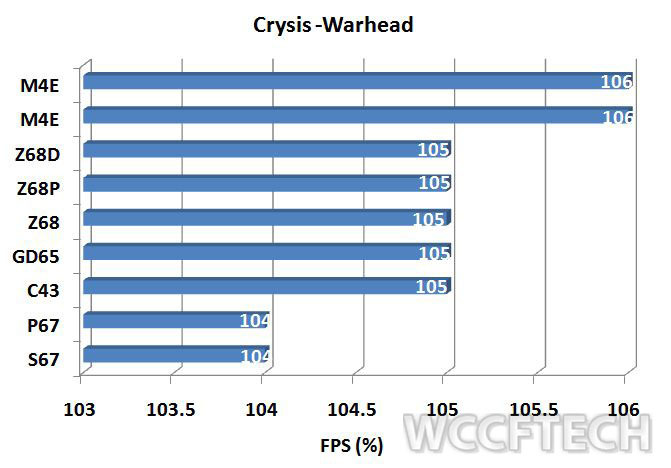 It is used to compare graphics as well as processor performance. There is nothing new here. The numbers that we saw with our very first LGA1155 review (LINK to Sabertooth p67 review) are the same we are seeing today. If it weren’t for the MSI P67-C43 this would have been the easiest graph to read. The differences are minor enough to be ignored. Just like all the benchmark results shown so far. The Extreme-Z is up there with the best, but the rest are not miles off either! To make things as fair as possible only Intel powered SATA ports were used during testing. 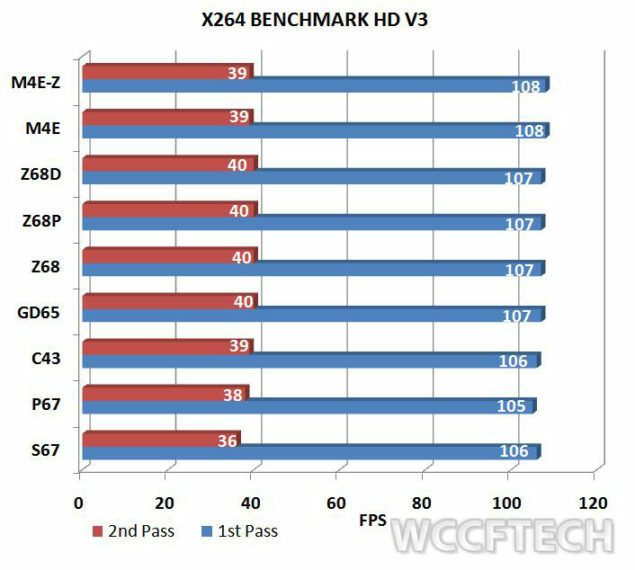 And as all the ports are coming off the P67/Z68 PCH, the performance thus is the similar. 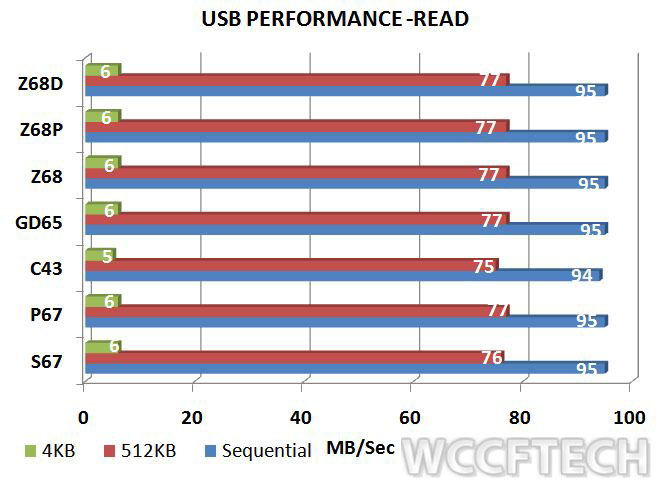 If Intel’s SSD cache technology (on Z68) is taken in to consideration, it would lead the pack. 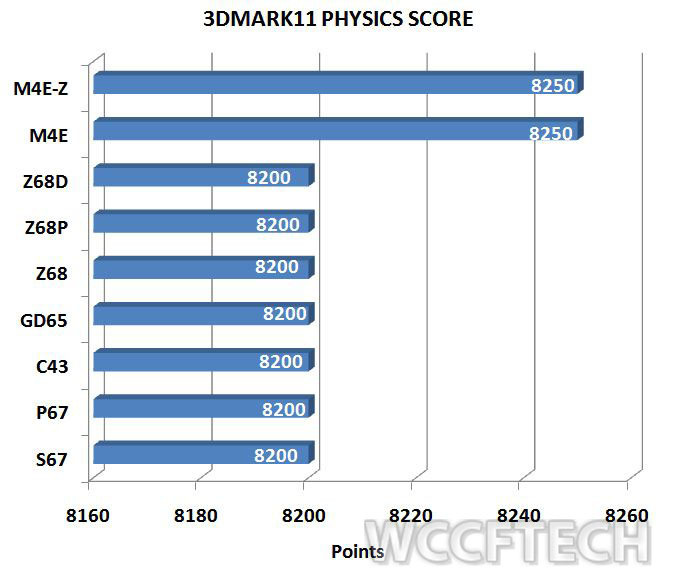 The board’s results mirror those of other P67 and Z68 boards reviewed by WCCFTech. 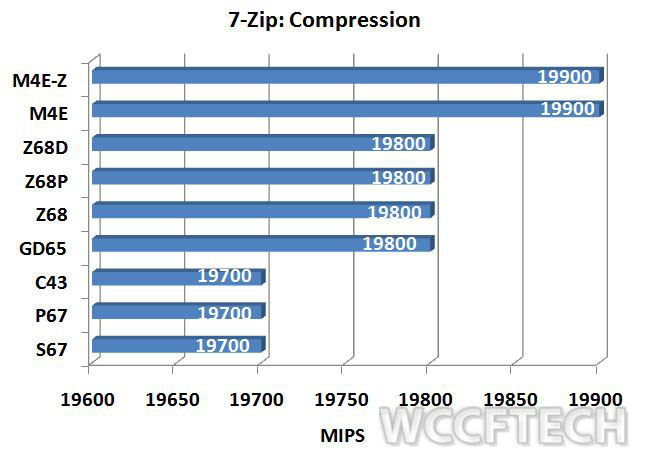 The MSI P67-C43 (link), P67-GD65 (link) and the Z68-GD65 (link), the Asus Sabertooth P67 (link) and P8P67 (link)all have shown similar benchmark performance. Like the M4E, the M4E-Z is loaded; the board is feature rich. From NF200/ PLX chip combos for extra PCI-e lanes to provision of up to 12 USB 3.0 ports the board has it all. The all-important question is how important are these features to you? 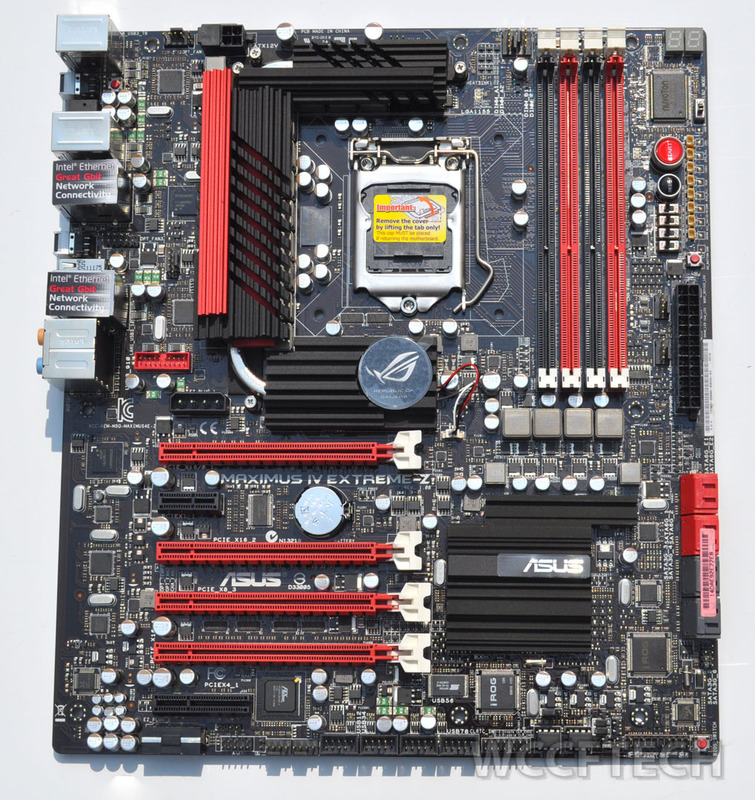 As you have seen the performance difference between various LGA 1155 boards are negligible at best. It is the features that set these boards apart. 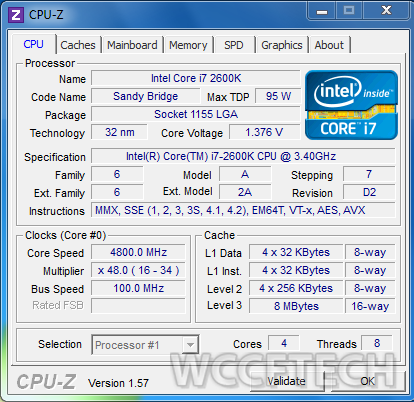 For those looking for the absolute best in Z68 implementation you have to look no further. The bus stops at the M4E-Z!